I caught up with Bea Warner, founder of Exaactly - the retailtech startup that’s looking to end ‘sorry I missed you’ delivery cards, for good. We are a small London-based startup called Exaactly. Our goal is to put an end to failed deliveries! That's why we are developing an intelligent addressing solution: We ask online shoppers where precisely they want to receive their parcels and what a driver should do if they are not at home, to ensure delivery success. We like to compare Exaactly to PayPal: Similar to how you can save all your card details with PayPal, you can save all your address details with Exaactly. You only add your information once and then you can use it across retailers and carriers. The original business idea came from living in a rural part of the UK and having what's quite a common problem: delivery drivers always having to call you to ask for directions, instructions, or landmarks to find where you live. This was pretty frustrating. On top of that, I was ordering more online in my life — as we all do these days. When I was in university and working in London, I constantly changed my address every year. So I had four in Edinburgh and I had six in London within five years. It was an effort to keep up with my online address updates on various sites. I thought the whole system was pretty archaic. Especially when you receive failed delivery notes, it's like: "Yeah, I'm at work all day. Like the rest of the city. Well, what do you expect?" There didn't seem to be any way I could explain or describe where I was happy for items to be left. I have my own place where I am happy for things to be left when I'm at work. So the whole system feels very outdated. It doesn't fit with a modern, busy lifestyle. Other than the initial idea that was seeded by my father and developed out by myself, I've always been super curious about businesses and passionate about seeing things grow. I have an obsession about how far you can push any idea and how far you can take an opportunity. To date, we have £362,000 in funding. That's a combination of investors including Shaf Rasul who is at Dragons Den and the John Lewis Partnership that invested as part of their JLAB programme. The first round of £262,000 was made up by angels and one fund. Depending on your stage, it's very appropriate to go down the angel route, especially when it's at a pre-seed stage which we were at. The angel route is much, much quicker and is much more cost effective because it's without a whole series of fees. Where do you find investors? Good question! They don't tend to walk around with a label on their head. So it's all about having a really strong network. Before starting the business, I wasn't in the startup or tech scene whatsoever. So I quickly had to build up a network, predominantly through going to events. I find in this ecosystem people are so happy to try and help you. You meet one person and you get three introductions. Investors can be people that are underneath your nose as well. One of my angels actually came out of where I live. Because they live on the same lane as me, they have the same pain point and they really resonated with the business. I definitely suggest steering clear of VCs for the pre-seed round. And they’ll steer clear of you too. I would say it was a combination of founder and idea. At that stage, we didn't even have a product to demo to anyone. That wasn't in existence. There really wasn't a team. We had a couple of contractors and freelancers and we had one developer. But to be fair, there was actually only myself, before I built the team out and brought on the amazing Lisa with the fundraising money. So, at that stage it is a gamble for investors and they simply have to click with the founder. They have to have chemistry and it's only a gut feeling. Of course there's a business plan, there are financials but, none of that is going to come true. Everyone knows that. So it is truly about the chemistry and the business idea. My decks looked horrendous. I’ve done so many pitch events in front of 300+ people and the presentation was like a PowerPoint by a 12-year-old. So I’d definitely say it's all about the delivery. Whenever you listen to anyone, you're listening to the person. You're not looking at their slides. They only make 10 percent of the impact, and really I’d see slides more like a skeleton framework for the presenter than of use for anyone else. So it’s all about how you present and if you‘ve got loads of energy, then people simply want to listen to you and are curious to find out more. In terms of content, the template for a pitch deck is pretty standard: top line introduction - what the problem is - how you’re looking to solve it - more about your product and a demo - progress to date and traction - concluding with the team and who sits behind the business. 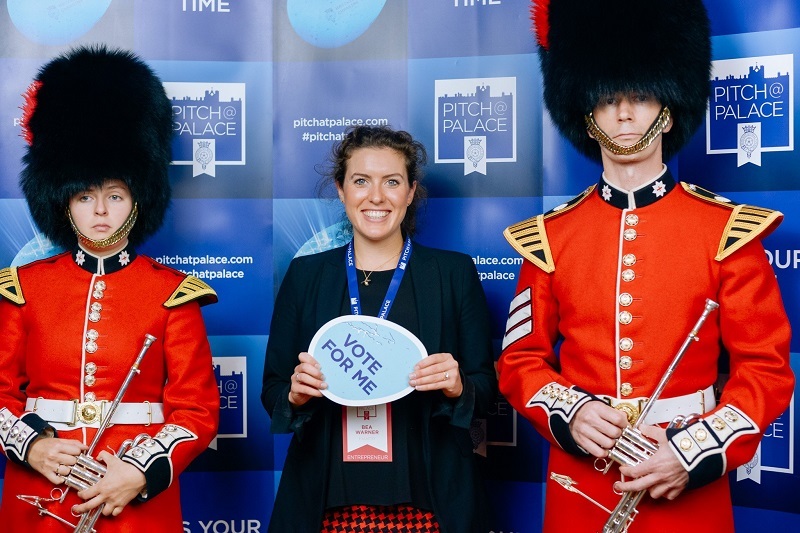 We’ve won quite a few pitch events and our Product Manager Lisa is insanely good at pitching and I'd say for both of us it is always the energy that we bring and that's really what people want to listen to. Oh god... It always takes three times as long as you think it's going to take. So you have to keep up a lot of momentum. It’s 100% a full-time job. But at the same time, you're also wearing ten other hats, trying to grow your business to show traction for investors. It is really draining. It's hard to keep your energy up. You’re doing the same pitch day in, day out. Sometimes five or six times a day... So you get bored of your own voice very quickly. It feels like you're constantly speed dating. And of course, you get a lot of rejections. That's part of the course. It’s like one in ten people you see will ask to see you again, so you just need to ignore the rejections. So like with dating, you just need to realise: It's not you. It's them. And don't worry if you had all your make-up on that day. But it’s hard at the beginning, because essentially you are your business, and you need to learn to differentiate. One, stay positive. Running a business is all mind over matter. I’d said two, don't compare yourself — that's where I fell short. I'd often look at other companies and think: "Oh my god, they raised a million at x valuation and they only started 6 months before me." Don't compare yourself. Everyone's on their own journey at their own speed. Three, persistence. you gonna get knocked back so many times. And you just gotta keep picking yourself up every day and keep on going until you get the money in the bank. Always keep thinking of what you're going to spend the money on, what it's going to take to take your business to the next stage, and keep gunning for that. And don't focus on all the frogs you have to kiss along the way! How did you hear about SeedLegals, and what made you decide to use it for your round? I actually did a Google search because I thought the whole fundraising system was so broken. The lawyers are crazy expensive, the whole thing is crazy slow. I didn't have any templates and every law firm I went to would have given me a different set of templates. So I googled tech startups for legal fundraising and SeedLegals came on top of the search. They also emailed me that same day. It just felt like it was meant to be. What's next on the horizon for Exaactly? 2018 will be a super exciting year for us. We’ll be launching the product. We are going live with our early customers. We’re doing a scale-up trial with John Lewis and Waitrose. And we’re also being joined by our new COO which will help the business to think with a lot more clarity and strategy.